Another e-cigarette explosion has left a 27-year-old man badly burned in Westchester. Roseanne Colletti reports. A 27-year-old man in Westchester County was hospitalized and treated for severe burns to his left leg after sustaining injuries from an e-cigarette that allegedly exploded in his pants pocket. Jacob Dudhnath was on his way to a plumbing job early Monday morning when the emergency call went out. NBC 4 New York spoke with him from his Westchester Medical Center hospital bed by phone. 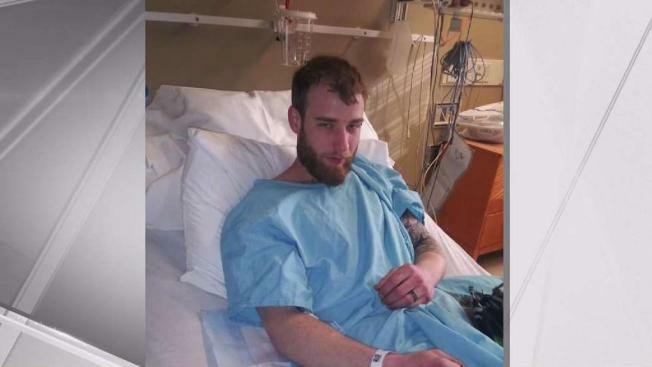 According to Dudhnath, he arrived at his first job site when he felt the sparks from his e-cigarette's spare battery and then it burned through his pants pocket and down his pant leg. Dudhnath says a coworker who was with him and saw the smoke emanating from his pants was able to rip the piece of clothing off him. His coworker rushed Dudhnath back to the plumbing supply store where an ambulance met them, Dudhnath says. Their office manager, Debbie Nye, says she couldn't believe her eyes, adding "his leg was all burned." Experts say 62 percent of e-cigarettes that explode do so while they are in use or carried in a pocket. There has been at least one fatality. Dudhnath, who is married with a son, says he is not out of the woods yet after sustaining first- and second-degree burns. "They say they're going to have to see how things start healing up," he said, adding he may need skin grafts because "it could get better or worse."